The popularity of Indian food has been on the rise around the world, for several years now. This is evident from the numerous Indian restaurants and pop-ups around the world. But while the world might be getting used to eating and enjoying Indian food, cooking it is still considered a task. Indian-origin food writer and author Mallika Basu is all set to change that, with her comprehensive guide to Indian cooking for busy people. Her book 'Masala: Indian Cooking for Modern Living' (Bloomsbury, 31 May 2018) is a helpful guide to cooking classic and authentic Indian meals, in a simple way. 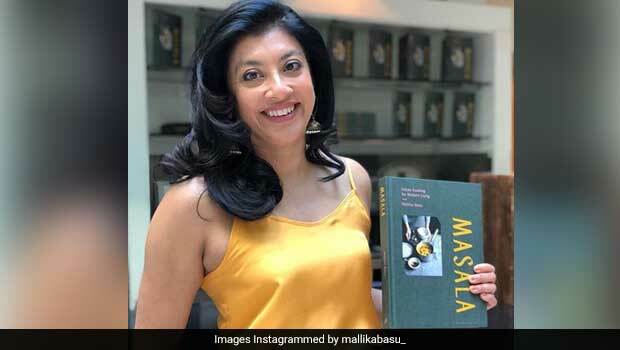 In India for the national launch of her book, Mallika Basu shared with us how she came to love Indian food, how her book came about and what her days look like. 1. When was the first time you cooked a full-fledged Indian meal? I left home at the age of 18 to do a business undergraduate degree in the UK. Before I went, my mom taught me how to make one chicken curry and one dal, so I wouldn't go hungry. The first time I cooked a full-fledged Indian meal was during my degree, when I put both recipes together with some boil-in-the-bag ready rice. 2. How did your love affair with cooking Indian food start? By the time I started my master's degree in journalism in London, I was desperate for proper ghar ka khana. I realised that if I didn't start cooking it, I would have to go without it. So, like a lot of other people in my shoes, hunger and necessity kicked off my love of Indian cooking. 3. Why do you think Indian cuisine has an advantage over others and where do you think it lags? Is there anything you would want to change about how Indians cook or eat? The biggest advantage Indian food has over other cuisines is its variety, diversity and ingredients. It is probably the only cuisine in the world where a die-hard meat lover can enjoy a vegetarian meal and not even miss meat! But seriously, just look at the variety of tastes, texture, flavours and colours in our food. Our many spices also give us a natural lead. The big disadvantage, however, is the unbeatable deliciousness of our fried and sweet treats and reliance on carbohydrates. I love all three, but without portion control it can be easy to overindulge in these. Combined with sedentary lifestyles, this also makes us vulnerable to a host of illnesses. 4. Why did you feel the need to write such a comprehensive book on Indian cuisine 'for the modern world' in particular? As I started cooking more for the family and also writing about food, I noticed that a lot of our recipes are very heavily reliant on nostalgia and how our parents and grandparents did things. I am a big fan of this, and often mine my own mum and nani for their recipes. But the reality is that we don't live like them anymore. We are living more global lifestyles, with less time on our hands and are increasingly concerned about how to get wholesome meals quickly and simply on the table. I wanted to write an Indian cookbook that was in sync with the lives we lead today. Masala is a very personal journey that I hope will resonate with others too. On a side note, I was very keen to reflect a contemporary design aesthetic with clean lines, muted colours and a minimalist textural feel. So, Bloomsbury made sure all stereotypical design elements like paisley, elephants and day glow colours were banned in the design brief! 5. Which stereotypes about Indian food do you encounter most often? Where do you think the world goes wrong with understanding and cooking Indian food? I often get asked how I stay slim, followed quickly by "you must never eat anything you cook". People think our food is basically thick, greasy curries served with giant helpings of rice. I am always talking about how Indian food goes well beyond just curries. In fact, a curry is not Indian food at all! While Indian food will never be health food, in the way the West defines healthy anyway, but it is wholesome and well balanced. The thali is the best example of a wholesome meal featuring all macro and micro nutrients on one platter. We are also the global home of spices and fermented foods. I am on a massive mission to set the record straight! 6. Flavours and tastes change when you travel away from the native country. How much a stickler for traditional, authentic recipes are you? I often cook for Indian friends and family, and it's important to me that things taste the way they should. So I fiddle a lot with cooking styles, shortcuts and techniques but never compromise on taste. Where there is a perceptible variation, I am open about it. 7. Going by the activity on your Instagram page, you are constantly cooking while being surrounded by friends and family. Is that what a typical day in the life of Mallika Basu looks like? Instagram tells a 1000 lies. A typical day in my life inevitably involves all the stresses and rushing around experienced by any working professional. I wake up by 7:30am, feed the kids, get them to school and then either head to the office or go home to work from my kitchen. I go out in the evenings to meet friends or contacts, they come over or I hang with the kids playing Uno and talking nonsense. Cooking fits into this everyday reality. I cook while chatting away with visitors or with the kids as an activity. I often batch cook so there is more for another day, which means I can chill few days a week. I am a big fan of freshly frozen home-cooked meals, so sometimes when I have no energy, I can just defrost a meal I cooked previously and it's as good as new. There are also lots of cheat meals like quick fire baked beans, cheese and macaroni or toasties with crudites - I am not always making massive meals! 8. Which Indian dish, according to you, is suited for all occasions and why? To me, this is dal. You can have it with rice or roti, or as fashion would have it in the west, as a soup! You can cook a light version for hot days, or a winter warmer for cold ones. There are so many variations and varieties that you can never get bored of it. 9. Which Indian cuisine is your favourite and why? This is a very tough question, impossible to answer! Every Indian cuisine has so much to offer and is so different. Even when we say South Indian cuisine, each state and region has its own wonderful and unique difference. Can I say pass? 10. Who are your favourite Indian chefs? I grew up on a diet of Sanjeev Kapoor and Tarla Dalal. Madhur Jaffrey is warm and wonderful to watch on TV. She was also kind enough to feature me on British TV show Curry Nation. Asma Khan is doing some great things in Britain with an all-female, all-housewife kitchen. And of course, there is an exciting crop of new chefs doing exciting things - Ranveer, Kunal etc. Personally, and as a home cook, I'd love to see more women break the big time!